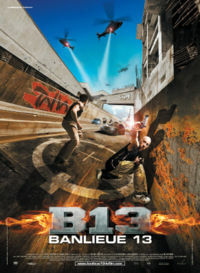 District B13 is the most famous Parkour movie. It was an English-subtitled version of the French film Banlieue 13. The film is not just based around Parkour, but several parkour-stunt scenes where performed without the use of safety harnesses, or cgi (computer generated imagery). This innovation has led to one critic comparing it to the popular Thai film Ong-Bak. David Belle, one of the founders of Parkour, appears in the film as one of the main characters. The movie is set in the near future, in one of the worst ghettos in Paris, district B13. It controlled by the ruthless Taha, a young rebel named Leïto (David Belle) is determined to knock him down. Taha then kidnaps his sister, Lola and Leïto has to make a rescue attempt. But this attempt is ruined by betrayal, and Leïto gets arrested, his sister stays within the clutches of Taha. Six months later and under cover cop named Damien (Cyril Raffaelli) is given the mission to stop a bomb which is stolen by Taha with an automatic timer set to go off in 24 hours. Damien and Leïto work together to find and stop the bomb, but there is far more to this situation that originally anticipated!